The White House has declined an invitation by Washington Nationals for President Donald Trump to throw out the first pitch on their opening day, citing a scheduling conflict. 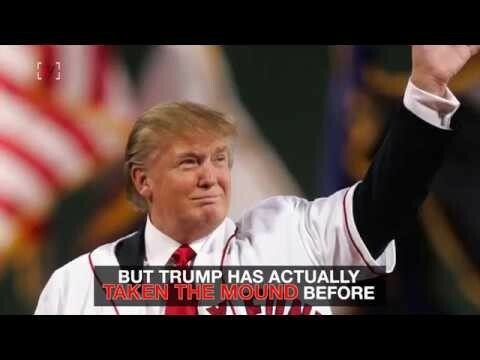 The Nationals invited Trump to throw the ceremonial pitch for their Apr. 3 game against the Miami Marlins. As reported by the Washington Post, the White House’s decision will mean that Donald Trump will be the first President not to throw out the first pitch for Washington’s Major League Baseball team. As noted by the report, William H. Taft was the started the tradition in 1910 for the Senators. Nine out of the next 10 Presidents continued to throw out the first pitch on their first opportunity in office – a tradition broken only when Washington was left without a major league team in 1972. “The White House has announced that President Trump will not be joining us on Opening Day dues to a scheduling conflict,” Washington Nationals spokesperson Jen Giglio said Tuesday. “As all of you know, inviting the President is a 100-plus year tradition here in Washington baseball – it began with the Senators back in 1910 and when baseball came back to Washington, the Nats continued that tradition.” As noted by Politico, Donald Trump was also in talks to spend an inning in the MASN broadcast booth. Trump has had an experience throwing out the first pitch, doing so for the Boston Red Sox when they hosted the New York Yankees in 2006. As noted by the Washington Post, George W. Bush restarted the tradition in 2005 following baseball’s return to Washington after a 33-year absence. In total, 13 Presidents have thrown out the first pitch on opening day for Washington’s baseball teams. The tradition has occurred 47 times. Donald Trump, though, could continue the tradition next season. Barrack Obama threw out the first pitch in his second year in office.